The Insights Association, New England Chapter is accepting Speaker Proposals from the research community for our Spring Conference. Theme: IMPACT! Our goal for the conference is to have speakers who demonstrate how their research, methods, efforts, and results have made an impact on their organization, their clients, the industry, their career, etc. Attendees can leverage this learning to make an impact on their own organizations and careers. Merriam-Webster’s Dictionary defines “Impact” as the force of impression of one thing on another: a significant or major effect. What is your impact? What will your impact be? How has your research made an impact? How have you made an impact on research? How have you made an impact on the insights profession and careers? What innovations have been impactful to the way research is conducted in today’s environment? Are there new qualitative techniques that you have embraced which have made an impact? What innovations will be impactful in the near-term, in the mid-term, in the long-term on the research industry? How have you used technology to make an impact? Impact can occur in a variety of ways, whether in research design, research execution and fielding, navigating legal and ethical concerns, research analysis or in the implementation of research findings. We invite speakers to let us know their impact and how such impact leads and will lead to growth within the insights industry. Thursday, May 9, 2019 at the Waltham Woods Conference Center in Waltham, Massachusetts. Location information can be found at Waltham Woods Conference Center. Please review SUBMISSION REQUIREMENTS on the next page. To submit a Speaker Proposal or a question/comment, please email our Speaker Manager David Varner: david.varner@incrowdnow.com. What form can sessions take? We encourage you to propose a format that promotes interaction, sharing or a hands-on experience. The goal is to offer something engaging and active. Send your submission to David Varner, david.varner@incrowdnow.com, by February 26th. – What makes you particularly qualified to present this topic? – Acknowledgement that your session will not be a sales pitch, marketing presentation or endorsement of any specific product or service. – NEIA would like to distribute pdfs of the presentation after the conference. If you cannot permit distribution, please note this in your proposal. Submissions are due by Tuesday, February 26th. Conference attendee fees for speakers will be waived, and technical support on site will be provided. Any special equipment or materials must be requested in advance. The final session line-up will ideally include a combination of sessions with immediate practical value, topics that will question assumptions and broaden our thinking, and presentations that demonstrate the use of innovative tools/methodologies. We strongly encourage sharing client-side examples and outcomes and bringing clients to present case studies as part of your presentation. 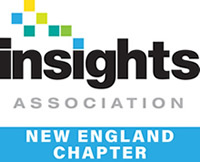 The Insights Association, New England Chapter offers educational and networking events with practical applications that address pressing challenges and expand our thinking as a profession. Our biannual conferences have been called a “must-attend” event for New England market researchers. These conferences often sell out, with close to 180 New England research practitioners in attendance! New England-based market researchers from a range of industries (including Energy, Financial Services, Healthcare, IT, Professional Services, Publishing, Retail).